The motorist/cycling divide is a hot topic at the moment. 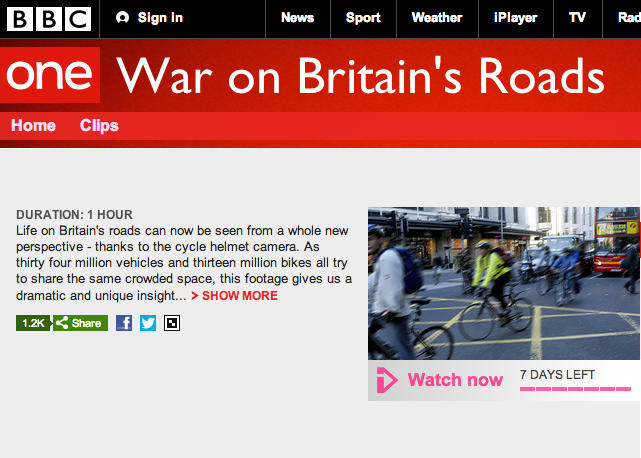 The BBC aired a documentary last night called War On Britain's Roads. It's already been called sensationalist by some, but word on the vine is it's totally compelling viewing. I say that because i've not seen it, and had no blooming idea the whole thing even existed until five minutes ago when my chick told me about it. Gonna find some time to watch it in the next few days. So should you, you can check the rhyme right here.